1/6 Sunday, 1131.0, 73/57, sunny, NNE5-10 - Last night as we slept, I kept hearing and feeling “whump” against the hull, like a log bumping. Dobbs and I both had thoughts that we’d somehow anchored over a wreck. 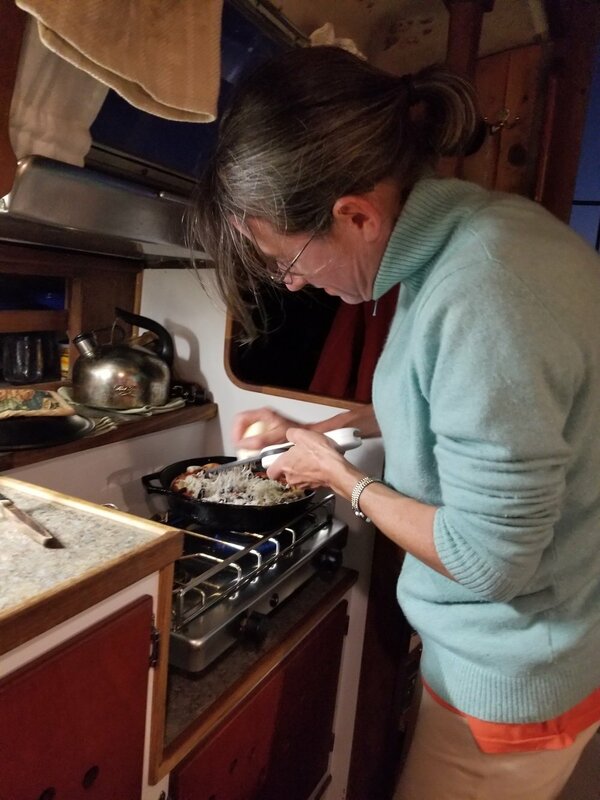 Only toward morning did we realize it was the small fish jumping out of the water and smack into Grace…and Coquille. Coquille looked (and smelled) like a true fishing dory! Dobbs started the day by bailing a dozen fish out of the dinghy. 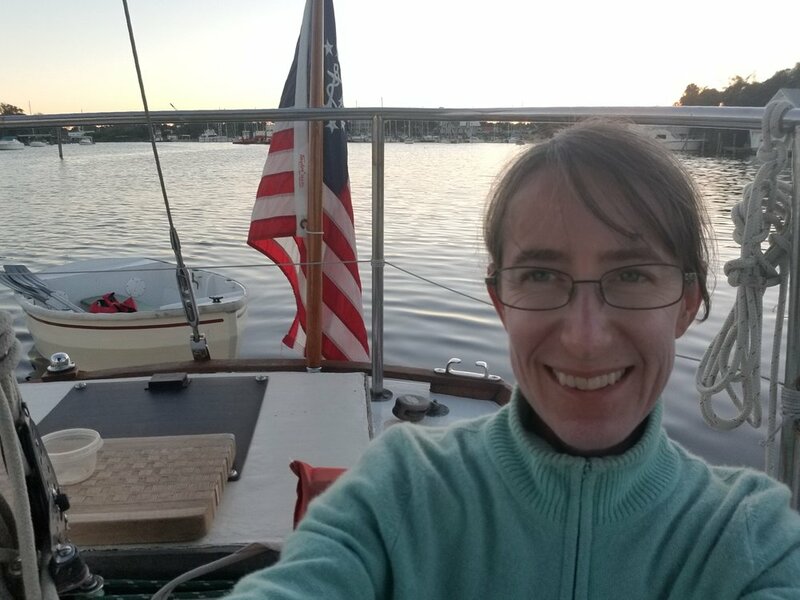 After breakfast, Dobbs rowed us into the Eau Gallie Yacht Basin, where we’ve landed before and had a nice repartee with the management - I wanted to see about buying ice. As we entered the fairway, the owner came out and waved us off, saying, “You’re not landing here. If I let you land, I have to let them (disgusted look out over the bum boats) land.” I explained that we wanted to buy ice - he said no, he didn’t have any. We tried at another marina on the south side of the basin, but a slip holder we met said they had no amenities. Our ice will just have to hold out for another day, and I think we’ll be fine. Dobbs rowed Murphy and me over to Ballard Park for a walk. Then he rowed us back to Grace, where we dropped off Murphy and picked up our tennis gear, and then went back to the park for a set of tennis. A group was playing doubles on the court adjacent to ours - it was pleasant listening to their banter. Dobbs won again, 7-5. He rowed us back to Grace for lunch (it’s probably all this rowing that gives him the tennis advantage). We spent the afternoon inside, reading and writing, with the hatches open and the sun shining warmly into the boat. We could hear pelicans splashing and dolphins breathing all afternoon. Dobbs took Max out for a little rowing excursion. 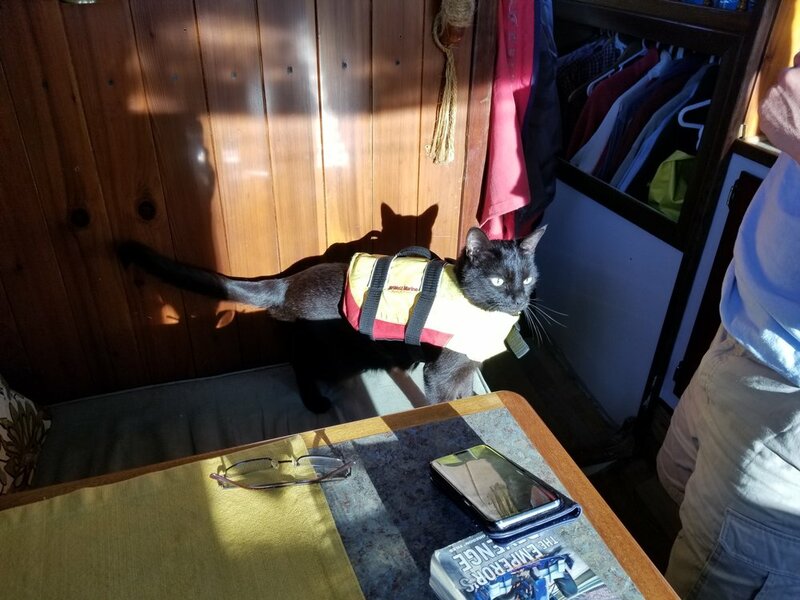 Our intrepid adventurer, freshly back from a harbor cruise. In the late afternoon, we sat in the cockpit for the hour or so before sunset. Waiting patiently for Murphy to become un-distracted by dolphins and remember that it’s time to go to shore. 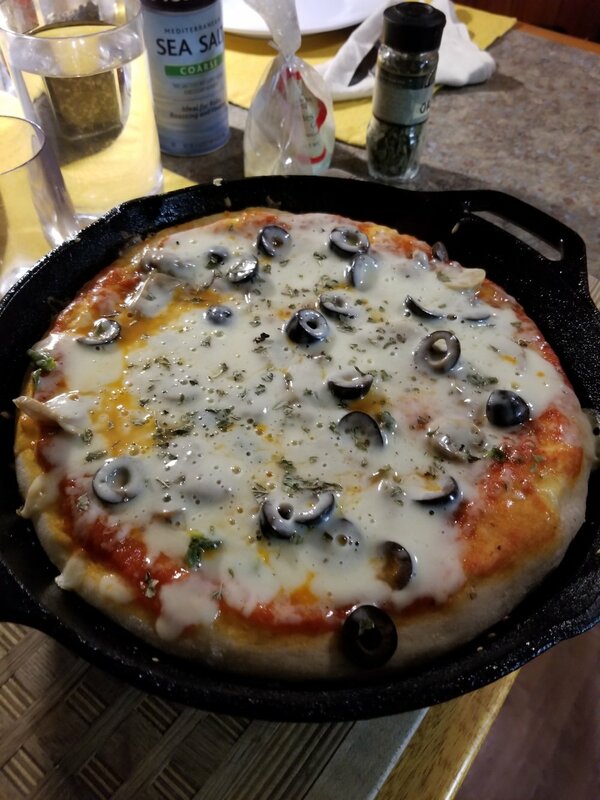 …while I made a pizza - a fun treat on a two-burner stove. Now, stuffed on mushroom, black olive, and green pepper pizza, we’re just writing a bit before retiring to bed. I’m reading a book by Claire Mowat about the people of the islands off the coast of Newfoundland, called “The Outport People” - picked it up at the Palm Coast Marina book swap.